Everton XI: Howard, Browning, Stones, Jagielka, Galloway, Barry, McCarthy, Naismith, Barkley, Kone, Lukaku. Well, no goals but real drama late on with Kevin Mirallas' challenge. That's all from me for today - you can follow all the reaction to this game over here. Modou Barrow's been causing havoc since he's come on! Kevin Mirallas is sent off - a studs-up challenge! John Stones has been brilliant again today. Just brilliant. His latest masterpiece is this last-ditch block to deny Eder. The Portuguese connected with a zipping cross in from the right, but Stones was there. Solid as ever. Gerad Deulofeu jinks away past Neil Taylor but his shot is poor. Kevin Mirallas is getting ready to come on for the away side. Ross Barkley will be coming off. A late injection of pace for Swansea with Modou Barrow on for Andre Ayew. Is it just me or is Everton's momentum petering out slightly now? Romelu Lukau cuts a disinterested figure, despite calling for the ball, as Steven Naismith fires over. Eder looks pretty rapid - and is straight into the thick of things chasing down a long through ball. But again John Stones can't be ruffled. He almost looked happy to turn and try and nutmeg the Swansea striker there as he collected the ball first. Andre Ayew goes in the book now for a very tired-looking lunge at Brendan Galloway. Eder is on for Bafetimbi Gomis as Swansea swap strikers. Everton looking good here. Brendan Galloway is very far forward indeed, does he know he's playing at left-back? Swansea are holding out though. So far. How many chances does the Everton striker need? Neil Taylor blocks with the Belgian seemingly set to steer home. He took far too long with his finish there. A yellow card for Ty Browning on his first Premier League start - a challenge from behind on Jefferson Montero. Can he keep it as a momento? It's Ashley Williams to the rescue for Swansea this time! British defending at its finest - a bullish header to divert Brendan Galloway's driven shot over the bar. His head must be ringing! Surely, surely there's got to be a goal soon. After all of these chances it really would be rude not to score. 20 minutes to go, to get one. One that could well turn out to be a winner. The boy has got a rocket of a shot - how on earth could Everton have given him space to turn and face goal like that, just outside the box? Tim Howard will let his defenders know how he feels about it all I'm sure. He parries the Frenchman's shot with strong hands. Maybe a placed finish would have found the net? What a header that is from Phil Jagielka! Jefferson Montero found space to cross down the left, Ki Sung-yueng was lining up the header in the box but out of nowhere this flying body clears the danger. And a change up top for Everton. Arouna Kone is off for Gerard Deulofeu. His pace could turn the game in the Toffees' favour. This has really livened up now. About time, too! Intriguingly poised, I think would cover it. Andre Ayew has moved to play more centrally now, closer to Bafetimbi Gomis. Jefferson Montero comes to life! Finally he gets the better of Ty Browning down the left. Montero cuts inside and unleashes a stinging shot palmed over by Tim Howard. Solid save. Gylfi Sigurdsson is off, Ki Sung-yueng on in his place, for Swansea. Will Sigurdsson play as close to Bafetimbi Gomis as Sigurdsson, or is this a sign of Swansea switching up in midfield? Ki to play deeper? 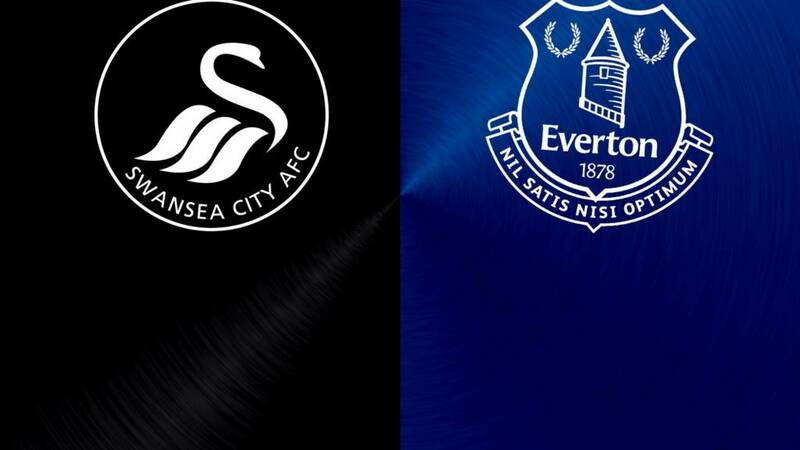 Just when Swansea look like they're feeling their way into it Everton pounce on the counter. But it all fizzes out when Romelu Lukaku takes centre stage. Again! Ross Barkley's deflected shot reaches Lukaku before Lukasz Fabianski, but the Belgian can only stab tamely towards goal. There was loads of time to clear it off the line. 106 yellow cards in Premier League football. And Gareth Barry knew all about this latest one. A cynical little tug on Kyle Naughton. Free-kick Swansea, on the edge of the box... Gyfli Sugurdsson hits it into the side-netting. Their first sight of goal for a while. And yet still Everton find a way through! Romelu Lukaku is played in on goal by Gareth Barry, whites of the eyes etc, but he smashes his finish way, way over. Where was the composure? A brilliant start from Everton this. Swansea are sucked in to their own half now. Left-back Brendan Galloway, what a bit of skill in the box! The youngster's played in by Ross Barkley, who's looking dangerous on the left now, but his finish is terrible. Ross Barkley breezes past Andre Ayew, fantastic skill down the left wing. The Everton man drills the ball in, Arouna Kone is on hand to tap home, surely!? No! Through his legs! He looks distraught, Kone. No idea how he missed that. Maybe there was just a tad too much power on Barkley's cross? Is that a chance? Go on then, I'll be generous. Andre Ayew steals in ahead of Bafetimbi Gomis to connect with a Jefferson Montero cross but he can't direct it on goal. A half-chance. Still, Swansea need all the encouragement they can get after that first-half showing. We're still a few minutes away from kick-off for the second half here. The injury to Andre Ayew meant we had a bit of a delay in the first. Looking back through the carousel of highlights from that first half, Bafetimbi Gomis really should have done better with his chance, one-on-one with Tim Howard. And just to be clear, the highlights reel isn't exactly a keeper. The cameras at the Liberty Stadium focus in on a slumbering toddler - that picture pretty much tells the whole story. If you wanted graphical proof of how Swansea are struggling to get into the final third of the pitch against Everton, let alone the Toffees' penalty area, then check out the heatmap on the left below. Everton (on the right) are doing rather better - and you can see how Ty Browning is helping them threaten down the right with his galloping runs forward. Is there time? Jonjo Shelvey feeds Bafetimbi Gomis and this time Phil Jagielka is there, right on his heels, to make the challenge. Ty Browning looks to have fouled Jefferson Montero, but the referee gives a goal kick. That should be that. Jonjo Shelvey's cross is cleared by... can you guess? John Stones. He's been a rock in this first half. Jack Cork goes in the book for a challenge on Arouna Kone before Swansea win a free-kick of their own. John Stones continues to read this game so well, and is brilliant with his distribution. Ross Barkley looks like making something of it as he motors towards goal, he's held up in the box and even with two bites at the cherry Gareth Barry cannot deliver a decent cross. Four minutes added on though. Here's Jefferson Montero finally with the ball where he wants it - close to the Everton box down the left wing. But it's Ty Browning who comes out on top, stealing the ball. Swansea win it back, build a bit of momentum but a misplaced Jonjo Shelvey pass kills it dead. The whole Jefferson Montero, Ty Browning toast scenario has so far failed to materialise. Instead it's not exactly been the other way round, but Browning's been getting very far forward down the Everton right. Not bad at all for your first Premier League start. Just over five minutes to go before half-time and there's a sense Swansea are going to have to hold on and see this one through. Everton threatening again when Ross Barkley feeds Romelu Lukaku, whose shot is judged to have been deflected over by Ashley Williams. I'm not sure from the replay, it looked like it was always rising. Arouna Kone skies one over the bar. Way. Over. Cue the biggest cheer we've had from Swansea fans for a while. Ironic, but they all count, right? Everton on top so far. Down the other end Ross Barkley is central to everything Everton are trying to build. A critical view would be: ponderous. More balanced would be: pragmatic. Barkley's got those dancing feet but if there's nothing on then possession is 'recycled' - sent back to the halfway line. It doesn't take a genius to work out the old Swansea tactic of Gylfi Sigurdsson into Bafetimbi Gomis. John Stones is a genius though, when it comes to defending. He brilliantly cuts out the through ball. So we had a good 10-minute spell where Everton looked pretty dangerous just now. It's undulating back into Swansea's favour. Or so it seems until Federico Fernandez is penalised, Ross Barkley swings in a free-kick and Romelu Lukaku flicks out a boot at a driven Steven Naismith shot from the edge of the box but Fabianski is alert. Three men around Jefferson Montero down the left. Which of the three actually stops him though? That man John Stones. Excellent defending turns a dangerous situation, with Montero set to cross, into an Everton goal kick. Big respect for Stones from Toffees keeper Tim Howard. John Stones could be in trouble here. He's down holding his knee. It's becoming a bit of a trademark, this Stones walk-out from defence. But this latest edition is brought to a crashing end by a Jack Cork challenge. To be fair to Cork, he barely touched Stones, who appeared to jar his left knee before going down. The physio's come on. Bit of a rub and a sip of energy drink, the youngster looks OK to carry on. Real danger for Swansea on the break! The away side counter from a corner, with Romelu Lukaku feeding in Steven Naismith. The three goals he got last week against Chelsea weighing on his shoulders, Naismith jinks past one defender and bears down on goal... but the Scot, too, fluffs his lines! He takes too long and Neil Taylor makes a last ditch block. Now we've got a game! Two in the space of two minutes for Gomis! Here he is through on goal but the finish is terrible - he fluffed it, dragged it wide. Bafetimbi Gomis tests Tim Howard - for the first time in the match. Brilliant technique from the Frenchman to control the volley when falling back and away from goal. It was low, but central, not too difficult to stop. And here's Ashley Williams again with another excellent block at the near post - the kind that so often end up going in past your own 'keeper. Phil Jagielka heads way over from the corner, the delivery gave him too much to do. Where are you Swansea? You'd forget they're the home side. Romelu Lukaku with it... blocked and out for a corner. A brilliant header from Ashley Williams to steer it wide! Looked like it was bottom corner. Andre Ayew's back on with two bits of cotton wool stuck right up his nose. Everton have definitely started the brighter here. Ross Barkley dances in front of the Swansea box, looks for a one-two with Steven Naismith, who's taken out by Ashley Williams. There was always a risk of this happening. Early doors but all very pedestrian so far. Both these teams like possession they said, both these teams play good football, they said. It's all about the ball to feet here, and the crowd's gone a bit flat with Everton stroking it about. Looks like Jagielka and Ayew are both going to be OK, though Ayew definitely came off worse. Phil Jagielka's skull is not the ideal destination for anyone's nose. The blood is streaming out, and he's had to go off for a patch-up. Ty Browning, making his first Premier League start, chops down Jefferson Montero on the left. That will be a very interesting one this afternoon. It already looks like Montero may well have him on toast at some point. No yellow for this one. Phil Jagielka and Andre Ayew clash heads looking for a loose ball in the box and the physios are rushed on. Browning can catch his breath. "Martinez is a very sound manager"
"Roberto Martinez is a very sound manager, in my opinion. Last season it was the Europa League that sapped Everton's resources. Martinez has brought Kone, Lukaku and Barkley all to the boil." Jefferson Montero makes a darting run down the left straight from the off, the crowd rises in response but he's soon crowded out and Everton win it back. Romelu Lukaku's not been so quick to start, sluggishly stretching for the ball as the away side work it up the pitch. Monk shares a man-hug and a few whispers with Roberto Martinez. Here we go then, the players are making their way out of the tunnel. Ashley Williams pours a whole bottle of water over his own head. Surely it's not that warm down in Swansea today? "Out of the blocks quickly this season, Swansea tripped over their laces last week at Watford. "Their passing was poor, the tempo too slow and they got what they deserved. Nothing. "Garry Monk won't tolerate a repeat of that performance and I expect a big improvement for the return of Roberto Martinez to his former club. "The Spaniard has got Everton purring again. Terrific against Chelsea, they produced the perfect away display when I saw them win at Southampton last month. "Both teams love to dominate possession. Which one manages to translate that in to goals will determine the winner of this game." Roberto Martinez has overseen two wins and two draws in his four Premier League games as Everton boss against the Swans. Will the unbeaten run continue today? No surprise to see Swansea striker Bafetimbi Gomis make the front page of today's programme - the Frenchman has been in brilliant form. Will there be a stand-out performance among the Everton lot today? Surely it can't be Steven Naismith again. What are the odds on another perfect hat-trick? Everton manager Roberto Martinez: "We’ve made two changes after the two injuries we picked up against Chelsea. But Steven Naismith had a full performance last week so that’s not much of a change. "We feel we started well but we want to kick on. The performances against Southampton and Chelsea were very good but it’s important we see another different approach today and perform really well. "Garry Monk, he was my captain here at Swansea and for me he has been incredible. I don’t think you’ll find a better manager in the Premier League over the three seasons he has been here." Swansea manager Garry Monk: "Everyone is fully fit so there’s just the one change from last week.The players have been training very well, there’s been a good focus and we hope to transfer that into the game today. "The good thing with this group is that whenever we have had a setback we have been able to respond. "I was team-mates with Roberto (Martinez) originally and then he came back in as manager here. He’s a good guy and we get on well, he went from a player to a manager like myself, so we have that relationship too. I’m sure we’ll have a chat after." Swansea manager Garry Monk makes just one change from the team that lost 1-0 to Watford last weekend. Winger Jefferson Montero returns to the starting line-up, with Wayne Routledge dropping to the bench. Everton manager Roberto Martinez makes two changes from the team that beat Chelsea 3-1 last weekend. Forward Steven Naismith gets a starting place after scoring a hat-trick, with Mohamed Besic dropping out, while there is a first Premier League start for Ty Browning, who comes in for the injured Seamus Coleman at right-back. Team news is in already - but first a little bit of housekeeping. Don't forget, you can predict the outcome of this match - and the rest of the weekend's fixtures - in our Premier League Predictor game. You can register your scores here and you have until kick-off time to submit them. And welcome to what should be an intriguing contest at the Liberty Stadium this afternoon. Swansea have started the season strongly, beating Manchester United in their last home game, but they suffered a bit of a stumble at Watford last week, losing 1-0. Everton are fresh from beating champions Chelsea 3-1 at Goodison Park last weekend and their victory at Southampton in August was the perfect away performance. Who'll come out on top today?